← What Happened to the ICC in Mali? FIFA President, Sepp Blatter, with former Liberian President, Charles Taylor, convicted by the Special Court for Sierra Leone for aiding and abetting war crimes in Sierra Leone. They may seem like bizarre bedfellows, but the worlds of international criminal justice and football / soccer have collided on a number of rather awkward occasions. In light of all the hoopla from last week’s dramatic arrest of a handful of FIFA officials in Switzerland on allegations of corruption, I thought it might be timely to take a look at two curious cases, one in which football’s fiefdom came face to face with a notorious perpetrator of mass atrocities and another when FIFA (almost) joined hands with the former chief prosecutor of the International Criminal Court (ICC). One might assume that Charles Taylor would have been a bit busy in 1999. After all, planning murder and plunder takes time and energy, all the more so when such crimes are committed in a neighbouring country. The Liberian President was embroiled in a long-standing civil war in Sierra Leone. For his role in the civil war and, specifically, for aiding and abetting war crimes, Taylor was eventually indicted and convicted to a fifty-year sentence by the Special Court for Sierra Leone. Still, in between stoking a war in which people allegedly devoured other people, rebels maimed innocent civilians, and thousands of lives were destroyed, Taylor arranged an opulent dinner with FIFA’s all-too-eager boss, Sepp Blatter. One might assume that Sepp Blatter wouldn’t meet with autocrats intimately implicated in the commission of mass atrocities. But then again, that’s probably not true – no one would assume that. Last week’s arrests and the cloud of corruption allegations around FIFA have only confirmed what we have known for at least the last ten years: there is no low Blatter won’t stoop to if it keeps him in power. 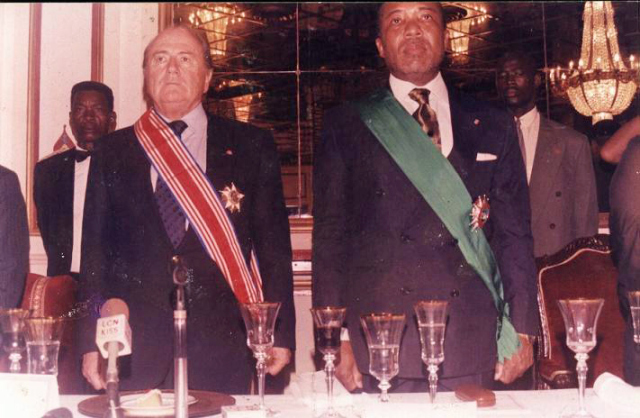 According to one report, during Blatter and Taylor’s opulent meetings in Monrovia, the FIFA President was awarded with Liberia’s highest honour, the Humane Order of African Redemption. In return, Liberia faithfully promised its enduring support for Blatter as FIFA President. But that transaction, questionable as it may be, was apparently just the beginning of their cozy relationship. When Taylor was forced to step down as Liberian President and subsequently fled to Nigeria, FIFA apparently paid for the head of Liberia’s Football Association and Taylor’s son-in-law, Edwin Snowe, to flee the country, pocket a $250,000 FIFA grant, and enroll in a Sports Management and Entertainment Events programme at a college in Denver, Colorado. You can’t make this stuff up. It bears repeating. Even if he had yet to be convicted, in 1999, the world was well aware that Taylor deserved to be held accountable for unspeakable atrocities in Sierra Leone. But to Blatter, a man of moral fiber akin to an over-ripe banana peel, Taylor’s crimes were irrelevant. 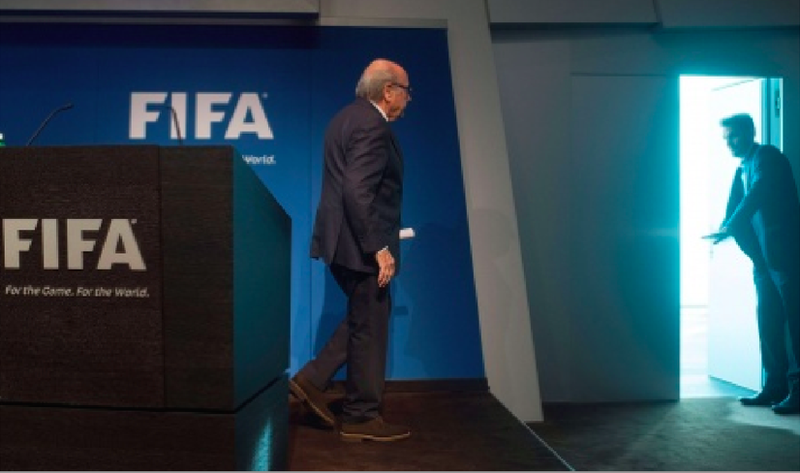 Yes – that’s the same Blatter who was just re-elected as FIFA President last week. Of course, allegations of corruption are old hat for FIFA. For years headlines have exclaimed that the organization sells its World Cup tournaments to the highest bidder, that FIFA exercises authority as a shadowy bastion of corruption, and that it all amounts to a private club and ruse to enrich its members (one of which was so absurdly wealthy that, while not bothering to make any tax claims in his native US, rented a private apartment in New York’s Trump Tower for his cats!). The Argentine is expected to be confirmed next month, and will investigate allegations of corruption or ethics rules breaches. Ocampo’s chamber will bring charges, while a separate arm will judge cases. In March, football’s governing body announced a wide-ranging overhaul of its governance, in light of a series of corruption allegations that have rocked the organisation over the last 18 months, concerning both World Cup bidding and the presidential election. At the time, I suggested that Moreno-Ocampo’s style and experience were an excellent match for the post. And then nothing happened. FIFA decided against appointing Moreno-Ocampo, instead opting to appoint an American attorney, Michael J. Garcia. Some believe that Moreno-Ocampo pre-maturely leaked news of his appointment to reporters and lost the job when FIFA realized that that was the exact opposite of what they wanted from their ethics and corruption tsar. Whatever their reasoning, the decision not to appoint the former ICC Chief Prosecutor ended what could have been a fascinating and full-of-fireworks marriage of international criminal justice and the world of football. Will Justice Catch Up With Football? Given last week’s events, I can’t resist a final comparison between FIFA football and international criminal justice. While FIFA’s corrupt core goes far beyond the man at the top, doesn’t Sepp Blatter come across as a stubborn warlord / dictator afraid of giving up power because it might just be the only thing that protects him from being prosecuted for international crimes? I guess not quite. This entry was posted in ICC Prosecutor, International Criminal Court (ICC), International Criminal Justice, International Law, Justice, Liberia, Sierra Leone, Special Court for SIerra Leone (SCSL) and tagged Charles Taylor, Corruption, FIFA, Luis Moreno-Ocampo, Sepp Blatter. Bookmark the permalink. Reblogged this on Curi2010's Blog.